The opening title track reveals not why they are not with a big record company. The refrain is great and the dynamics of the thumping bass line is quite impressive. The next track, “Taiga”, is perhaps more ominous why. The spark simply isn´t there in spite of a fine structure, and the songs tales a good two minutes to get into gear. 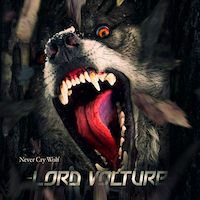 LORD VOLTURE also has a penchant for operating in the seven minute plus territory, which is more than their song ideas can take. But they succeed in songs like “Korgon´s Descent”, “Necro nation” and “The Wolf at Your Door”. The final touch, the illusive “it” in the music business is lacking, but their strongest moments are good enough to get them fans. Unfortunately the US concept has always lacked in the refrain department, and the song ideas are too basic to become concepts that will be up there with e.g. VICIOUS RUMORS. The main low point of the album is the odd “Brother”. It´s an acoustic piece, with vocals that grows in intensity and the strain on David´s vocals is apparent. Yet the guitars continue in lighter waving friendly pace, making the idea fail. Still, quite decent, but in need of some re-thinking…or this is their swan song.